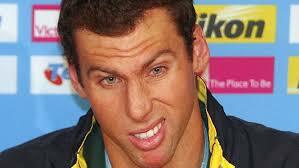 Grant Hackett Records Personal Best Public Embarrassment. Home › Sport › Grant Hackett Records Personal Best Public Embarrassment. Swimmer Grant Hackett has gotten over his disappointment at not recording an Olympic qualifying public embarrassment during the Australian trials by recording a PB during a flight from Adelaide to Melbourne. Critics have noted that the ready availability of smart phones with cameras have made it much easier for modern day athletes to record a public embarrassment. Despite Hackett not making the team Australia’s swim officials are confident of being among the medals in public embarrassment at the Olympics. The latest public embarrassment is not expected to dent Hackett’s career as a corporate motivational speaker.